Level 7 - Application: According to the requirement, this level works with the application software to provide communication functions to check the availability of communication partners and resources to support any data transfer. The Domain Name Service (DNS), File Transfer Protocol (FTP), Hypertext Transfer Protocol (HTTP), Internet Message Access Protocol (IMAP), Post Office Protocol (POP), Simple Mail Transfer Protocol (SMTP), Telnet, and Terminal Emulation. Layer 5 - Session: Layer 5 Software Handle Authentication and Authorization Functions. It also manages connectivity between both communication devices, establishes a connection, maintains a connection, and closes it in the end. This layer ensures that the data is distributed as well. Level 4 - Transport: This level provides quality service (QoS) functions and ensures full distribution of data. Data is collected at this level through error correction and similar functions. Level 3 - Network: Network layer handles packet routing through logical addressing and switching functions. Layer 2 - Data Link: Unpack data in Layer 2 Operations package and Frames. 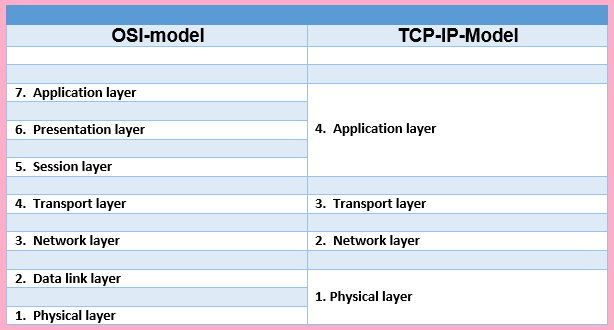 Layer 1 - Physical: This layer defines the logic level, data rate, physical medium, and data conversion functions, which make the bitrate of the packet from one device to another.